It was a big night for bluegrass super duo Dailey & Vincent at the Grand Ole Opry Friday (12-30) evening. Celebrating their 10th year as a duo, and their 100th appearance on the Grand Ole Opry, Jamie Dailey and Darrin Vincent—who played their first official show on the Opry stage—were formally asked to become members of country music’s most historic institution. The duo played a special half hour extended set Friday night, and were joined on stage by Marty Stuart and Connie Smith, as well as John Carter Cash and his wife Ana Cristina, Dailey’s father JB Dailey and Vincent’s mother Carolyn Vincent. Near the end of the set, Marty Stuart shocked everyone by asking the duo to become official Opry members. “Country music needs you. Country music loves you. 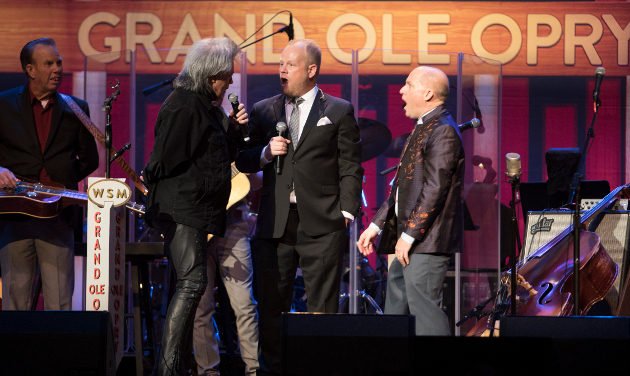 And the Grand Ole Opry welcomes you,” Stuart said. Obviously, they accepted, and will be formally inducted into the Opry on Saturday, March 11. “This is one of the most special things that has ever happened to us,” Dailey said. “We’re so thankful.” The duo has won a total of 35 IBMA awards, including 3 Entertainer of the Year distinctions, but now they receive one of the highest honors in all of country music. The Dailey & Vincent induction is special for some other reasons as well. Whereas the majority of new Opry inductees in recent years have mostly been pop superstars who rarely keep up their performance obligations, the last two inducees have been indicative of the legends and more traditional acts that regularly play the Opry stage in the absence of today’s current stars performing on the legendary stage. On November 15th, it was Crystal Gayle who was asked to become a member—a distinction well-earned and well-deserved, but somewhat surprising given the Opry’s recent inductions. Now adding a traditional bluegrass duo seems to indicate a new direction by the Opry with their membership. Frustrated for years over newer, mainstream artists not paying their dues, perhaps the Opry has finally begun to accept that it is the artists who put art and country music first who still respect the Opry, and the Opry should reciprocate that respect as opposed to trying to lure newer stars to the stage who ultimately don’t take the opportunity or obligation seriously. Great evening last night watching this in person! Dailey and Vincent were truly humbled and honored to be asked. What a fine way to end 2016 for them. Good for them, and the Opry! Love their music and their distinctive sound. Jim Lauderdale should be their next artist asked to join the Opry. Good choice for the Opry and great news for D&V, who are well deserving of the honor. outstounding. really what I needed to hear to start my day off right. saw them live it was the best show I ever did see. Congrats to Daily & Vincent.Now,if they would just ask Darrin’s brother,Rhonda Vincent to join,that would be great too.She has done more to pay her dues to become an Opry member,as many times she has been on over the years. Gene Watson should also be asked to join. This is great news. More singers who can sing without autotune, less singers who can’t sing.